The old industrial and warehouse blocks of Williamsburg around Driggs and Roebling Avenues from Union Avenue to N. 6th Street and being redone with new buildings. Most will rise 6-8 stories and some will take up significant portions of entire blocks. The latest such project that is coming together is on N. 9th and N. 10th Streets between Driggs and Roebling. We know this because we were walking up the block and noticed the beginnings of a construction fence about to go up. 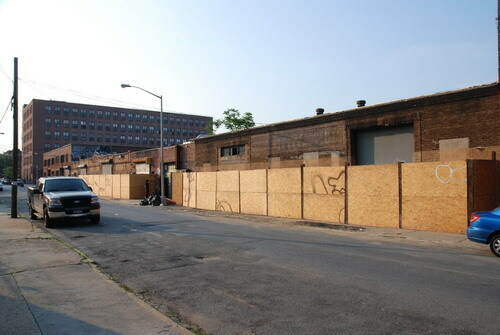 We checked and several of the buildings on the block (totaling nearly two-thirds of the block) changed hands on May 9. The only holdouts are the building at 221 N. 9th that houses Capones and another on N. 10th. There are no actual building permits applications on file yet. It will be interesting to see if excavation finds anything, as the building site is across N. 10th Street (N. 10th Street side is in the photo below) from the south side of Roebling Oil Field. More construction sites to sniff! For all its mediocrity, I have a somewhat romantic association with this building. In the mid-nineties, when living in DC, a friend of mine asked me to take the trip up to New York to go to one of a mutual friend's epic house parties. These were held in the building just north of the one in the picture. We battled the turnpike for a few hours and went over a bunch of bridges and over passes I'd never seen before. 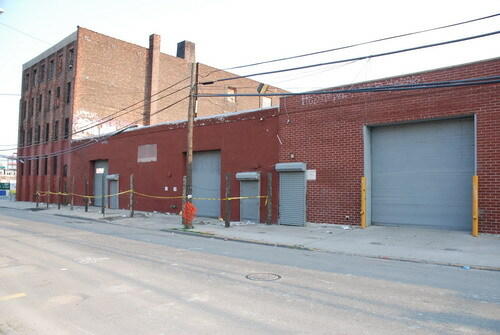 We got off the BQE and drove around some completely desolate one-ways until we parked in front of this building. We got out of the car and stretched our legs. He told me, "Don't leave anything, I mean not even a McDonalds bag, in the car!" I pulled my bag out of the back seat, took a breath of cold air, and asked him, "So this is Brooklyn, huh?" He said, "Yeah, this is Brooklyn"